The Fenix BC21R sports good construction (click to enlarge). 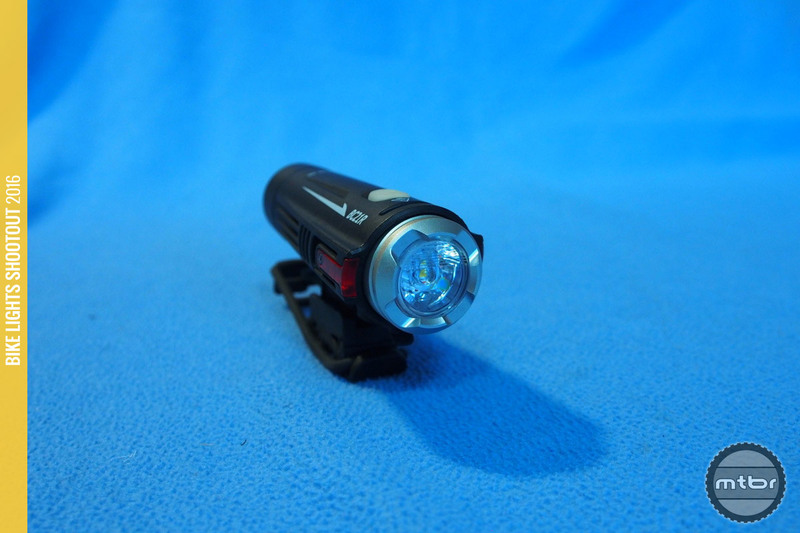 The Fenix is a self-contained light from Fenix claiming 880 Lumens for an affordable price of $80. It features a field replaceable battery, thus allowing the rider as much run time as needed by carrying spare 18650 lithium batteries. There is red side lighting available and there are cut-outs in the lens cap to give it good side visibility. Additionally, Fenix prides itself in controlling the beam pattern well with a fairly distinct cut-off on the top and a secondary beam that illuminates the trail directly in front of the rider. The highlight of this light is the beam pattern. It’s got a nice warm color that’s not too white so it’s easy to see shadows and trail contours. More importantly, the beam is very well controlled. It has two spots, one that lights up the trail immediately ahead and one that reaches far ahead. Periphery is well lit with good spill at close range. Finally, the top is chopped off a little bit to conserve light from being wasted at the very top of the beam. It also allows the rider to avoid shining the top of the beam into drivers’ eyes when commuting on the road. Fenix BC21R has good heat sinking (click to enlarge). 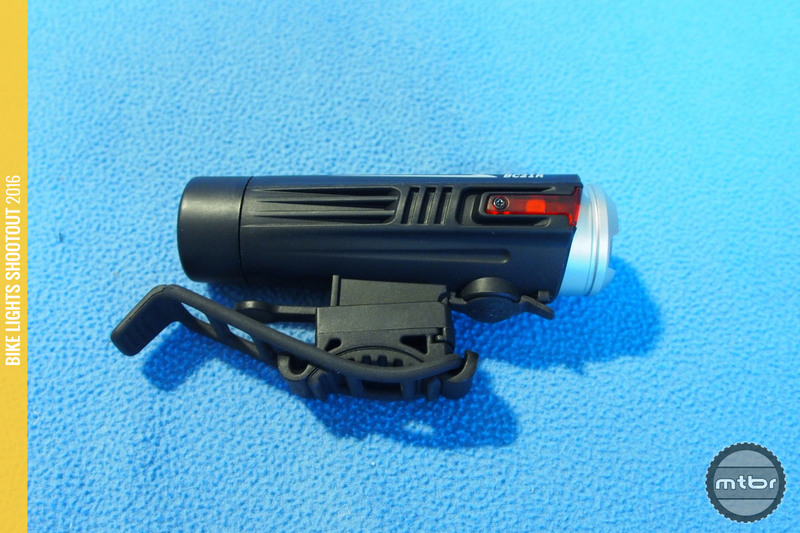 Infinite battery is a good feature of this light, as it uses a standard 18650 lithium battery that is field replaceable. The battery is very easy to access with a removeable rear cap. This makes long rides a possibility well beyond the 1:20 run time at the highest setting. The rider simply needs to carry as many spare batteries as needed. You state that the BC21R is made of plastic and sells for $80. According to Fenix Lighting this unit is made of aluminum and sells for $96. I THINK Fenix Lighting is the official company website but there are others that use the Fenix name in their title. This is all somewhat confusing. Fenix Lighting is just one of the US distributors, manufacturers website is really fenixlight.com. AFAIK the MSRP is actually 75 USD/75 EUR. Fenix Lighting just lowered the priceof the BC21R to $75, just below MSRP. Nope, only bike mounts im afraid ! It’s definitely made of alloy I got mine recently, great little light and I love the ability to carry replacement batteries! I got mine from rmoutdoors for just over £60! Are there any helmet mounts that work with this light? Fenix doesn’t make one. Love that there’s suddenly great options for torch-style bike headlights that take *standard* batteries. I’m really between this and the ITUO Wiz1 at this point. Mine just arrived and it’s plastic exactly as described by Francis. The silver at the end around the lens is metal and has gaps to make it more visible from the sides. One of those gaps is at the very top. I suspect when I’m standing on my pedals and leaned a bit over the handlebars it’s going to shine in my eyes. Nothing that can’t be fixed w/ a spot of tape. Last observation: when plugged into a microUSB charger, you can use it, but the only settings are “high” and “low” and “off”. Not sure how high or low those are compared to battery-only operation. Also, it works when plugged into USB w/o the battery, but makes an annoying high pitched sound and there’s only one mode (well, 2 – on and off).